As a result of increasing electricity prices, reduced solar photovoltaic (P.V.) prices and various economic incentives in the U.S., more and more commercial buildings, especially large square footage facilities such as warehouses and industrial facilities, are installing solar P.V. panels on their rooftops. Not only does solar power drastically lower a building’s energy bills, but there is actually revenue available for solar P.V. installation from selling any excess electricity back to the utility grid. However, if a building owner endeavors to make relevant EPAct qualifying energy efficient investments into the building before solar P.V. installation, the overall economic payback will substantially increase. Pursuant to Internal Revenue Code Section 48, companies or individuals installing solar P.V. can take up to a 30% tax credit of the total investment amount. In addition, sections 1104 and 1603 of the American Recovery & Reinvestment Act of 2009 allow for the taxpayer to take the tax credit as a cash grant so long as their energy retrofitting project qualifies. This option is exclusively made available for projects that have “begun construction” during 2009 or 2010. When using either the credit or the grant, five years MACRS deprecation is available. Solar P.V. rooftop systems are used to generate electricity in many building types. Warehouses and industrial buildings are typically the best candidates, but any building with large, unobstructed, flat roofs is a potential target for solar P.V. installation. Large roofs enable large P.V. systems that generate more electricity. Often, tax equity partners or utilities will be willing to make the investment for a rooftop warehouse solar installation and enter into a power purchase agreement where the warehouse operator, post-installation, will purchase its electricity at an agreed price for a fixed period of time, usually 15 to 20 years . In order to maximize the energy and tax savings from solar P.V. installation the owner must get the building into both physical and fiscal shape beforehand. In order to maximize the economic benefits of solar P.V. installation, the building owner must get the building into “physical shape.” When installing solar P.V. it is most important to maximize the useful roof space, meaning that as much of the flat areas of the rooftop should be uncovered as possible. In order to do this, the building owner should consider an energy efficient HVAC upgrade because most buildings have their HVAC systems on the building roof. However, the newer and more efficient HVAC systems can be installed on the exterior or interior walls of the building as well as the roof, which results in maximizing the useful roof space and potential large immediate HVAC tax deductions. Before solar P.V. installation the building owner should replace roofs at or near the end of their useful life cycle and improve insulation levels. The new roof and added insulation will enable the owner to install a less expensive energy efficient heating system while substantially reducing heating cost. A building owner should also make energy efficient improvements before solar P.V. installation in order to get the building into “fiscal shape.” In order to get the maximum $1.80 per square foot EPAct tax deduction, a building owner should consider a lighting retrofit before installing solar P.V . Many industrial and warehouse buildings currently have inefficient metal halide and T-12 incandescent lighting, whose production and importation is officially banned by the Federal government. This means that warehouses that still have this lighting technology will soon be subject to large price increases for replacement lamps and bulbs. Therefore, an astute building owner considering solar P.V. will perform a lighting retrofit to highly efficient fluorescent, induction or LED lighting in order to take advantage of the EPAct tax deduction and minimize future costs. The following chart illustrates the potential annual energy cost savings for a warehouse that installs solar P.V., which consists of the amount saved from lower energy lighting costs and potential net metering payments received. 1. Energy cost savings = kW saved (watts x .001) x 10hrs/day x 6day/wk x 50wk/yr x $.10/kWh. 2. Solar P.V. system assumptions: half of roof covered, 15 watts/sq ft panels. 3. Net metering is the payment that utilities are forced to make to the owner of a solar P.V. system for the extra electricity that is produced by the system. 1. EPAct tax savings based on 40% combined Federal and state tax rate, and $1.80 per sq ft tax deduction. The many available economic incentives for solar P.V. are in place to encourage country wide solar power growth. However, those who have already made the choice to upgrade to solar power should consider using all of these tax incentives to offset the initial up front investment and to lessen the economic payback time. For those who do not want to make the solar P.V. capital investment themselves, they should consider getting involved with utilities and letting the utility install the solar P.V. system on their own building. In this situation the utility wins because of all of the tax incentives and the building owner wins because they will get a discounted electricity rate as part of the power purchase agreement. All-in-all there has never been a time that is so ripe for solar power. When factoring in the energy cost savings, environmental impact and tax benefits, the time to go to solar is now. See “Payemnts for Specified Energy Property in Liew of Tax Credits,” United States Department of Treasury Guidance, Mar. 2010, <http://www.ustreas.gov/recovery/docs/guidance.pdf>. See Charles Goulding, Jacob Goldman and Joseph Most, Complete Warehouse Tax Enhanced Energy Efficient Design, to be published by Corp. Bus. Tax’n Monthly. See Charles Goulding, Jacob Goldman and Taylor Goulding, Tax Planning for the 21st Solar Century, Corp. Bus. Tax’n Monthly, Feb. 2009, at 23. 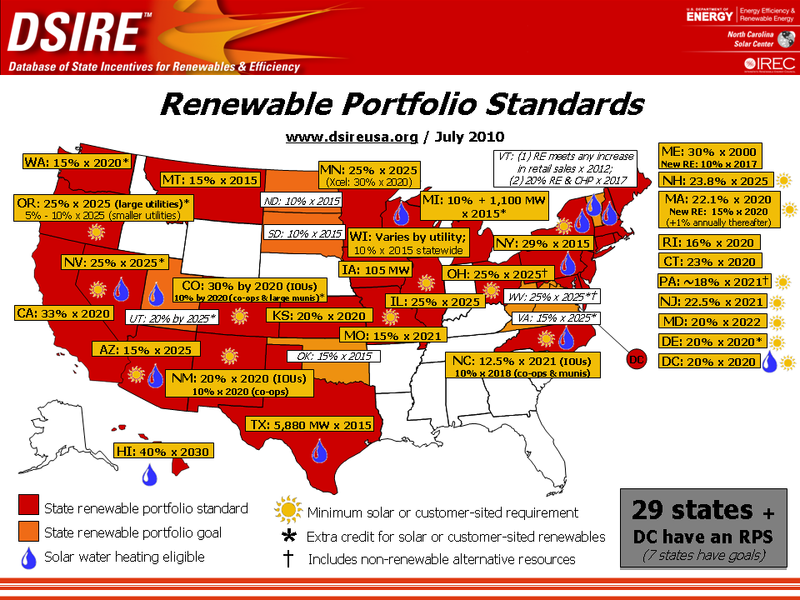 See “Renewable Portfolio Standards,” DSIRE Summary Maps, <http://www.dsireusa.org/summarymap s/index.cfm?ee=1&RE=1>. 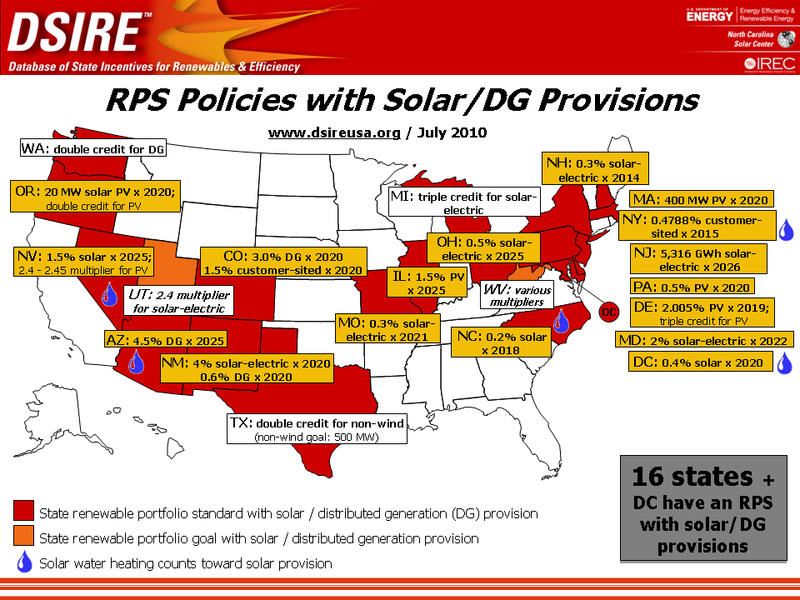 See “State RPS Policies with Solar/DG Provisions,” DSIRE Summary Maps, <http://www.dsireusa.org/ summarymaps/index.cfm?ee=1&RE=1>. Seann Convey is a Tax Analyst with Energy Tax Savers, Inc.